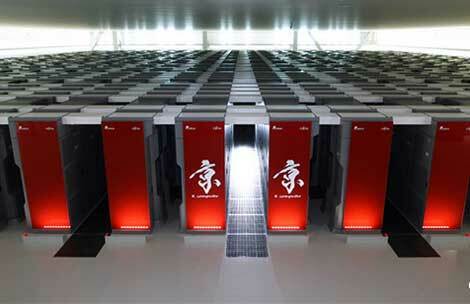 The K supercomputer in Japan. The human brain is arguably the most complex structure in the Universe. To unlock its secrets, scientists all over the world are mapping and simulating parts of the human brain. The latest breakthrough comes from Japan where scientists using the K supercomputer, the fourth most powerful in world, accurately mapped one second’s worth of brain activity. It took the computer 40 minutes to undertake this task, for one percent of the brain activity! A lot of people liken the brain to a computer. In many respects they’re right, but by no means can this comparison be made using conventional computers. The human brain has a huge number of synapses. Each of the 1011 (one hundred billion) neurons has on average 7,000 synaptic connections to other neurons. These connections are made at near-light speed and, most importantly, in parallel. It’s also very efficient, too. The adult human brain needs about 20 Watts of power. A conventional machine that could simulate the entire human brain would need to have an entire river’s course bent just to cool it! The K computer, with over 700,000 processor cores and 1.4 million GB of RAM, was used as part of a joint venture between Japanese research group RIKEN and German research group Forschungszentrum Jülich. So far, their research is the most advance of its kind. In the race to map the brain are also involved groups from the BRAIN initiative (USA), The Human Brain Project (EU), and Brainnetome (China). The Japanese group’s simulation was for 1% of human brain activity. To map the entire brain, an exascale machine would be needed, one capable of performing a quintillion floating point operations per second. Intel says that by 2018 it will release such a supercomputer.